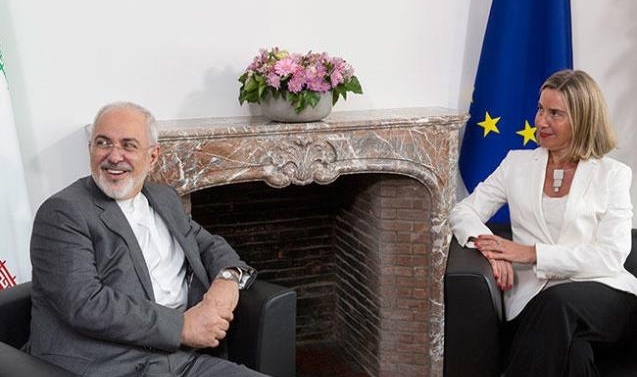 BRUSSELS: Iran’s foreign minister said Tuesday that efforts to save the nuclear deal after the abrupt US withdrawal were “on the right track” as he began talks with European powers in Brussels. Tehran has warned it is preparing to resume “industrial-scale” uranium enrichment “without any restrictions” unless Europe can provide solid guarantees that it can maintain the economic benefits it gained from the nuclear agreement despite the United States re-imposing sanctions. “I believe we’re on the right track to move forward in order to ensure that interests of all the JCPOA remaining participants, particularly Iran, will be preserved and guaranteed,” he told reporters. The deal’s official name is the Joint Comprehensive Plan of Action, or JCPOA. But European diplomats have sought to play down expectations of Tuesday’s meeting, stressing the enormous challenge of finding a way around U.S. sanctions punishing foreign businesses trading with Iran, which have global reach. “There is no one magic solution – there will be a complicated, comprehensive series of options at both the EU and national level, therefore it will take some time,” a senior EU official said. EU leaders aim to show a united front on preserving the Iran deal when they meet for a pre-summit dinner in Sofia on Wednesday, officials said. European firms, especially those from France and Germany, rushed to invest in Iran following the 2015 accord, under which Tehran agreed to freeze its nuclear program in return for the repeal of punishing international sanctions. German exports to Iran totaled nearly 3.0 billion euros in 2017, while French exports soared from 562 million euros in 2015 to 1.5 billion in 2017 and oil giant Total has pledged to invest some $5 billion in the South Pars gas field. When he quit the deal last week, US President Donald Trump gave businesses a maximum of six months to wind up operations in Iran or face penalties under American sanctions. On May 14, Zarif also sent a letter to the United Nations in which he accused the U.S. of showing a “complete disregard for international law” in pulling out of the deal. Washington has long complained that the nuclear deal does nothing to stop Iran’s ballistic missile program or its interference in conflicts across the Middle East from Syria to Yemen. On May 13, U.S. Secretary of State Mike Pompeo said Washington still wants to work with Europe to counter Iran’s “malign behavior” and was working hard to thrash out a more wide-ranging deal with its European partners. Ahead of the May 15 meeting, British Foreign Secretary Boris Johnson said the European powers would not shy away from pressing Iran on these issues. “Our meeting with Iranian Foreign Minister Zarif in Brussels is a chance to discuss how we can continue to support sanctions relief with Iran while they maintain their nuclear agreement obligations, but also raise our worries about Iran’s wider, disruptive behavior in the Middle East region,” Johnson said.